Ragan Hale, left, and Sarah Stamey, hold Sophie and Vivi who went to forever homes in Rhode Island. These two fur sisters were found by Ragan Hale, 17, in Natchitoches Parish. They appeared to be wandering around and confused. They were obviously dumped off by someone and left but Ragan didn’t know that at the time. Joyce Bonner and Gordon Chritensen fostered Sophie and Vivi after they were rescued by Ragan Hale, right. Ragan holds VIvi and Sarah Stamey, left, holds Sophie. They were adorable little black lab mix female puppies. The puppies were starving and had cuts, scratches, bloated wormy bellies and were infested with fleas. Even with this they were still so personable and friendly. Ragan did look for the owner, even though she didn’t want them going back, but had no luck. Thank goodness. She even posted pictures of them on social media in case they were being looked for. In the meantime, she and her friend fed and watered them. Ragan called a couple of people that are involved with animal shelters in the area but everything was full and no one had any openings. Juanita Murphy, who works with the Natchitoches Humane Society and Happy Tails, talked with Ragan and advised her on what to do with them and for them then continued working with Ragan on what to do for their future. 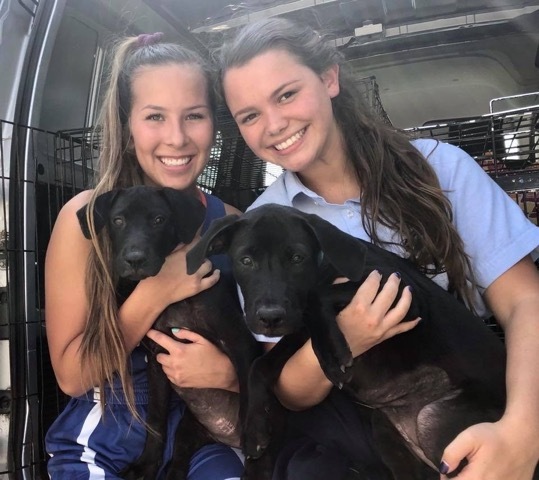 Ragan is an animal lover and couldn’t believe someone could mistreat and just dump two adorable little puppies, so she decided she was going to foster these two little sweeties and get them adopted. She took them both to Pet Star in Natchitoches, where the staff and veterinarian, Dr. Trey Underwood, were wonderful. Ragan and her friend, Sarah Stamey, took Sophie (pink collar) and Vivi (green collar), (named by Ragan) to get a thorough exam where they received their first round of shots, de worming, flea and tick pill,and given some special shampoo to get them looking pretty again. Ragan’s grandparents had the perfect yard and environment and thankfully agreed to help foster Sophie and Vivi until they could find their forever homes. They kept them about a month feeding, watering, loving, and training them to sit and stay. Ragan would come over daily and play with them and she and her friends, Sarah and Macy Vascocou, would bathe them with the special shampoo a few times a week until they looked perfect. The pups went back to Pet Star to get their rabies vaccine and to be spayed. They did great and have both gained about 5-6 pounds each. They are super smart and soooo sweet. They are going to make fantastic pets for children and families. Ragan was so thankful to have Juanita to get Sophie and Vivi set up with Rhodi’s Rescue in Rhode Island to take these southern gals and get them adopted. We can’t say enough good things about Juanita. These two puppies are living a Cinderella story thanks to so many people being so kind and helpful. A special thank you to Pet Star Animal Clinic, Joyce Bonner and Gordon Christensen for keeping them the entire time, Sarah Stamey and Macy Vascocou, Ragan’s friends and fellow animal lovers, and of course Juanita Murphy. Sophia and Vivian will have wonderful new homes with caring families all the way in Rhode Island. From this experience, Ragan has decided that this is something she will do for other dogs and animals as a young person and an adult. She is a 17-year-old junior at St. Mary’s High School, and I couldn’t be any prouder of my daughter for doing this. The Christian values that she has learned from her parents, church and school were seen in this small act of kindness and service and can definitely be displayed by others in our community.